One of five ‘Articled’ evangelical churches, so called because they were built under the article of the law issued in 1681 by Emperor Leopold I in an attempt to halt the spread of protestantism. As such they had to be built at the edge of a village with the entrance facing away it and to be constructed only from wood with no foundations, towers or bells. It was originally planned to build 38 wooden articled churches in Slovakia but only nine were built and of these five have survived. All of them were designed in the form of a ‘Greek cross’. The wooden church at Leštiny dates from 1688 and is relatively small and unsophisticated in design, with a wooden belfry. Construction was restricted by the terrain, hence there ios only a hint of the shape of a cross. The interior of the church is noteworthy for its richly-decorated sacristy, painted marble ceiling coffers and illusory architecture on the walls. Also of interest are the main altar from the beginning of the 18th century, the church pews with their coats of arms, the burial flag of J Zmeškal and the epitaph of M Meška of 1753. 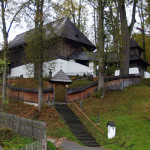 The church at Leštiny, along with seven other wooden churches of the Slovak part of Carpathian Mountain Area, has been included on the UNESCO’s Word Heritage List.